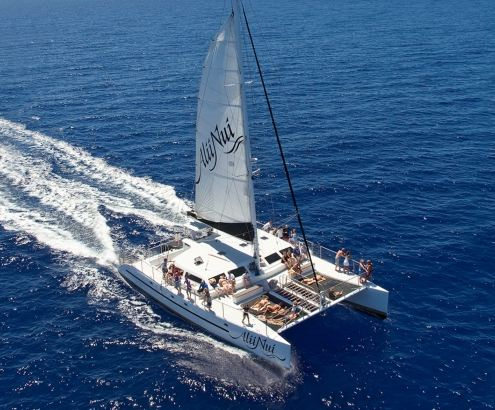 Ali’i Nui, the most Luxury Sailing catamaran to Molokini, is the only company that offers complimentary transportation from your resort. 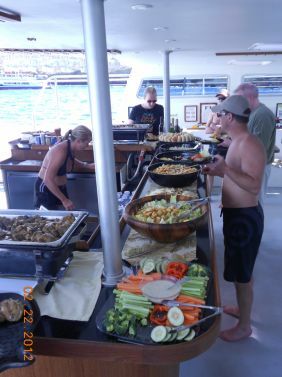 At Maalaea Harbor, as you board the vessel, head into the cabin for large breakfast buffet featuring scrambled eggs and bacon. The Ali’i Nui Snorkel Tour is luxury at its best. 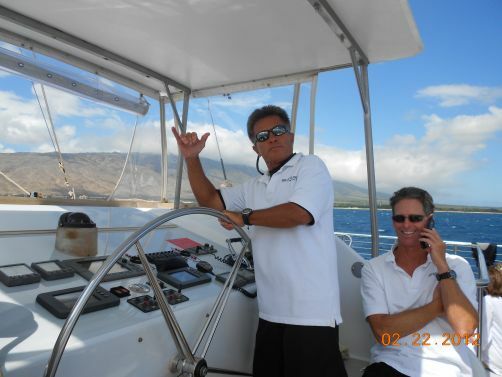 An impressive 65′ from stem to stern and 36′ port to starboard, it is truly the premier sailing catamaran on Maui. The Ali’i Nui has a reputation for providing the ultimate in service and amenities. They also limit the number of passengers to provide plenty of room to relax and enjoy. 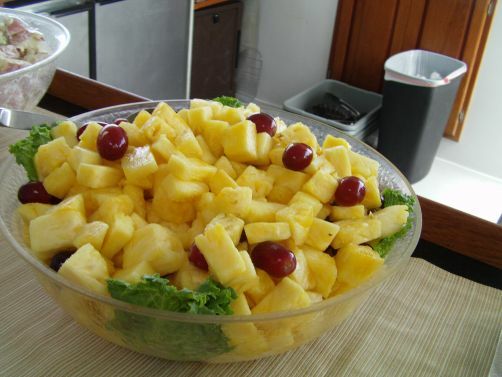 Price includes hotel pick up, a sumptuous hot breakfast and a large hot BBQ lunch buffet with teriyaki chicken, BBQ pulled pork sandwiches with three types of salads. Premium cocktail, beer, wine, and champagne. 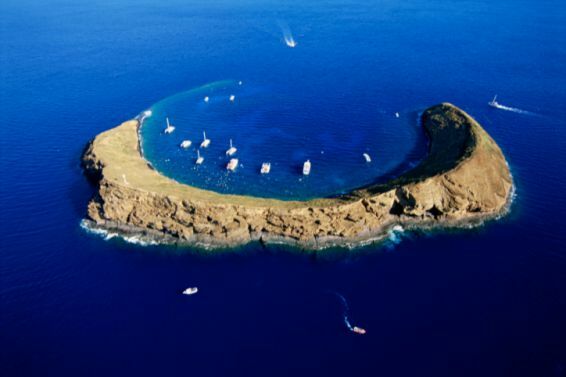 Molokini is Maui’s most popular snorkeling destination, with a coral reef system and lots of tropical fish. 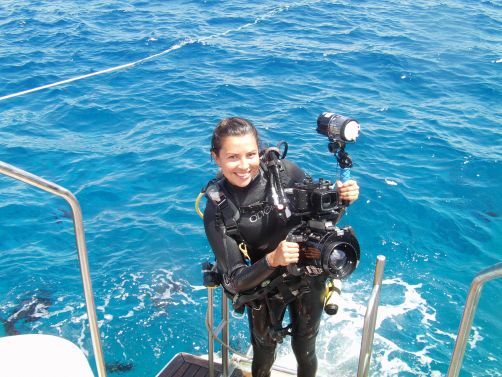 Your second snorkel location is at a Turtle Reef. Lunch is normally served at Turtle Reef and it includes cocktails, fine wines, champagne, Maui Brewing Co. lager beers, and ales. Between the end of December and the end of April, this trip has a great opportunity to see Humpback whales in the waters off Maui. 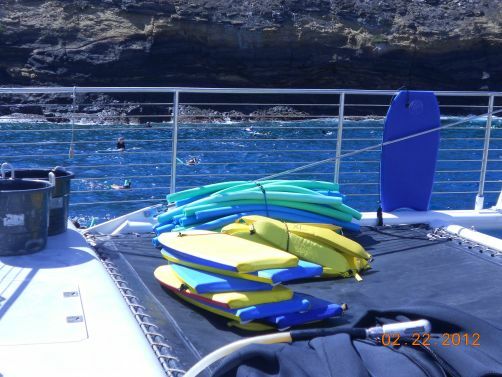 For snorkeling adventures, the Alii Nui provides top of the line snorkel equipment. Included as regular amenities are boogie boards, water noodles, wetsuit tops, optical masks and large terry beach towels. Once you have had your fill of snorkeling, enjoy a refreshing rinse-off shower with Ali’i Nui’s heated fresh-water shower. 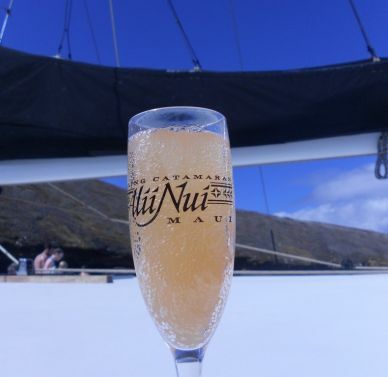 Alii Nui’s crew only want to serve you and make sure that you truly have plenty of time to do nothing but relax and enjoy everything that the Alii Nui has to offer. Small groups, plenty of deck space and multiple trampolines (hammock-like lounging), ensure ample room to kick-back and stretch out so you can bask under the warm rays of the spectacular Maui sun. However, if you prefer the shade, you’ll find plenty of seating under a spacious, covered cabin. After snorkeling and lunch, sailing on the way back to the harbor makes it a wonderful day on the ocean. Prepare to be pampered. **Leave the driving to the Alii Nui. Experience the comfort and ease of complimentary transportation service available from resort areas on the south and west sides of Maui. A comfortable van will pick up and return you to your hotel or condo in style. 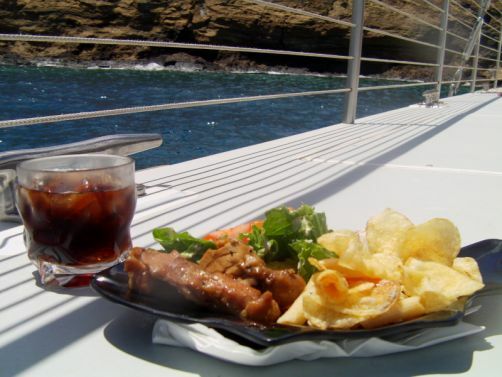 This service is offered on all Morning Snorkel and Sunset Sail adventures as space permits. *Parking Fees at Maalaea Harbor: There are “Meters” at Maalaea Harbor. The price is .50 cents for every Hour. 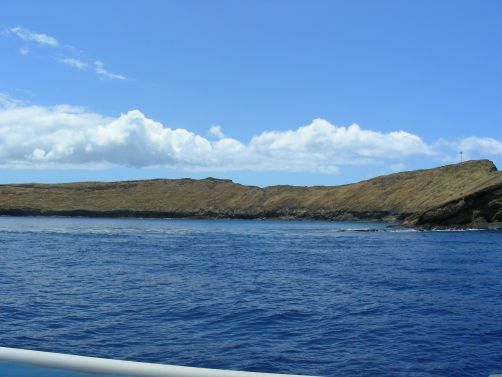 The Molokini Turtle Town Snorkel Tour is normally 5-6 hours long. You may want to make it 6 hours ($3.) to be on the safe side. 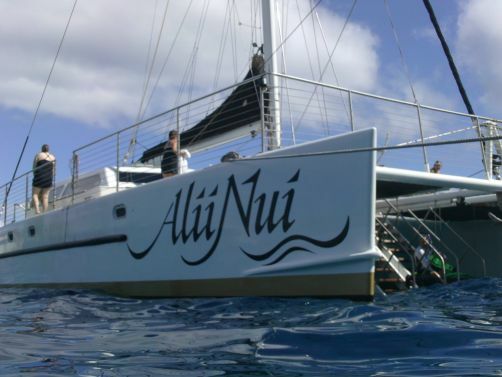 Alii Nui is the only boat that has complimentary towels and sunscreen on board. They also have Alii Nui Baseball caps they will give you if you so desire. Start the day with hot scrambled eggs and bacon. 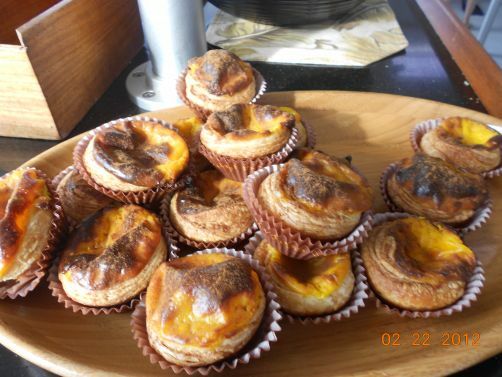 Also enjoy an array of sliced fresh island fruits, croissants, bagels, and a variety of muffins served with cream cheese, butter, honey and jellies. Choose from an assortment of fruit yogurts, all served with freshly-brewed Kona coffee, tea and juices. Our mid-morning snack consists of Maui chips, crudités of island vegetables, accompanied with ranch dip and salsa. Indulge in a bountiful lunch which includes roasted pepper, garlic hummus and pita bread, Kona coffee, award-winning kiawe-guava smoked pulled pork, marinated teriyaki chicken thighs, classic Caesar salad, potato-mac salad, coleslaw, fresh fruit salad, cornmeal dusted kaiser buns, wheat bread and butter. Be sure to save room for the yummy homemade macadamia nut cookies, and fresh island pineapple. NO refunds or changes within 48 hours of activity unless otherwise stated. A 10% cancellation fee will be applied to all cancellations made outside of 48 hours of the activity. Please note: We require all bookings to be made at least 48 hours in advance of the event so that we can guarantee your reservation. If you would like to book an event within the next 48 hours, please call us toll free at 1-888-841-9155 and we would be happy to assist you. 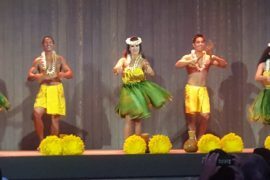 Maui Sights & Treasures, your home for finding all the best tours and top activities in Hawaii! Our company mission is to find the best activity tours for our guests, so they may have the best vacation memories and experiences.